This page is still being developed. Please check back soon for even more content. Over the next few months we will be adding more case studies and more resources on some of the issues dealt with in the studies. Please get in touch with us on AfricaGWAtlas@bgs.ac.uk if there are any particular issues you would like to see the Atlas deal with, or if you have any suggestions for additional case studies. Thankyou! The case studies below provide practical examples of groundwater-related issues and how they have been addressed in countries across Africa. They cover issues at different scales, in different climates, and with varying natural and political environments. 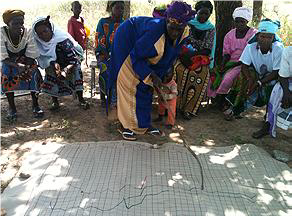 They provide practical examples of how groundwater is developed, used and managed in countries across Africa, with links to more detailed information for those who want to explore further. 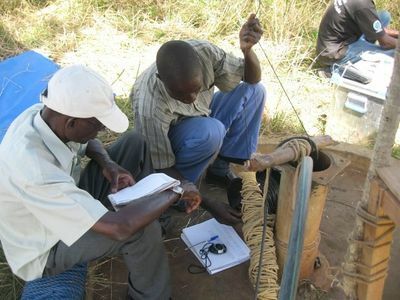 These case studies cover issues as diverse as: groundwater monitoring at community level; self-supply and family wells; groundwater management strategies at national and transboundary scales; professionalising and capacity building in the drilling sector; groundwater use for small scale irrigation; water payment behaviour; reasons for water borehole failure and strategies to improve the quality, operation and sustainability of groundwater wells and handpumps; and how different activities such as mining or land use change can impact groundwater quantity and quality. The Groundwater Solutions Initiative for Policy and Practice (GRIPP) produce a groundwater Case Profile Series, with reports available to download. Cover of GRIPP Case Profile Series 01 - Aquifer Contracts: A means to solving groundwater over-exploitation in Morocco?